There is a long tradition of scrolls on the topic of the Orchid Pavilion Xiuxi with its floating wine cups, attending poets and, most famously, the calligraphy for Wang Xizhi's preface commemorating the event, which took place in the spring of 353 CE. Shown below, in sections, is my copy of the long scroll showing the poets, their poetry and the wine cups floating in a stream.2 My copy of Wang Xizhi's preface (shown at right) is on a short scroll, separate from this.3 On appropriate occasions it is enjoyable to unroll one or both of these scrolls while playing one or more of the qin melodies having a related theme, specifically Liu Shang, Xiuxi Yin and/or Lin He Xiuxi; the latter sets to music Wang Xizhi's preface, but it is not clear that this was intended for singing. The original stone(s) should most likely have had all 42 scholars. They are shown drinking and writing poems, which are put in boxes. Various servants are also depicted. In the present rubbing one of the scholars (王彬之 Wang Binzhi and his two poems; see #26 below) is missing and another (王蘊之 Wang Yunzhi and his poem; see #33) is mostly cut off. Servants using sticks to put in wine-cups upstream. A final inscription; it says, "蘭亭詩兼公權續得者亦上，伏惟簡領入篋，餘冀面話不次。十二日公權狀上給事閣老，閣下青標換卻舊者，謹空。"
Today people usually assume "蘭 lan" always refers to orchids, but modern commentary says that at the time of Wang Xizhi it referred to flowers of the aster family such as eupatorium (further comment). Wang Xizhi's Lanting Preface (蘭亭序 Lanting Xu) was set to music for qin in 1664, but this apparently was never well-known and it is not clear that it was ever intended to be sung. 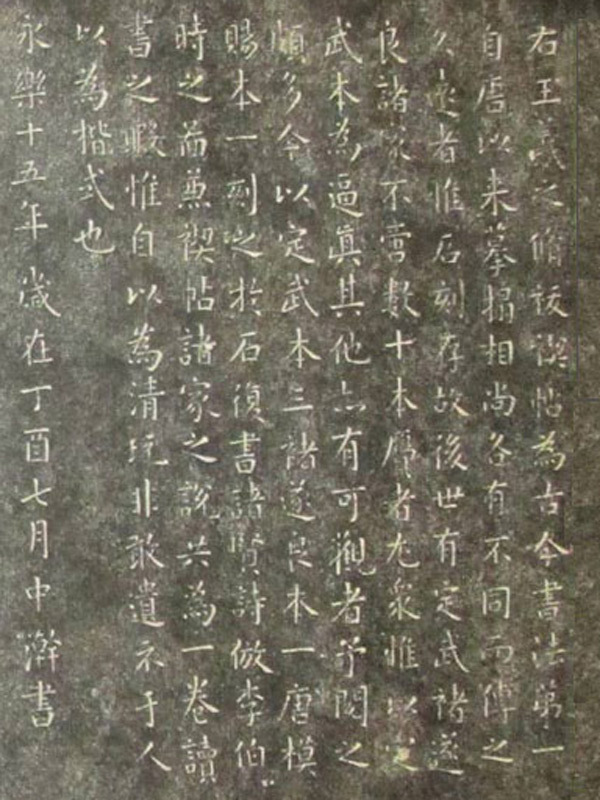 The earliest commentary on the preface itself centered on appreciation of the Wang Xizhi's calligraphy, said still to be the finest example of running style or semi-cursive script (行書 xingshu). The original copy was lost at least by the Tang dynasty, but still extant are close copies that were made starting around that time. The tradition of paintings purporting to depict the Lanting Xiuxi has not been traced earlier than the Southern Song dynasty. I don't know the date of the earliest known scroll or how it was made. The one at right, by 文徵明 Wen Zhengming (1470–1559), is in the 北京故宫博物院 National Palace Museum, Beijing. There is also a fine example by 錢榖 Qian Gu dating from around 1560 at the Metopolitan Museum in New York (online segment). The version shown here was purchased in 2000 in a curio shop at Lanting, on the southern edge of Shaoxing. It consists of 9 sheets pasted together into one long scroll. 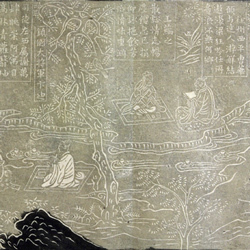 The full dimensions of the rubbing itself are 23' 4" x 1' (280" x 12" or 7.11 x 0.305m; the scroll onto which the rubbing is attached is, of course, somewhat larger). The poems are in sheets 2 through 8. This is said to have originated as a scroll that combined a copy of Wang Xizhi's own calligraphy with an illustration of the event by the famous Song dynasty artist 李公麟 Li Gonglin (1049−1106). However, the source of the illustrations on the present rubbing is not clear: perhaps Li Gonglin's work supplemented with a version by 益宣王朱翊鈏 Ming prince Xuan of Yi, Zhu Yiyin (1536-1603)? It may also be that the stones were at the 圓明園 Yuanming Yuan outside Beijing (Wiki), but were destroyed in 1860 by British and French troops during the Second Opium War. In the latter part of the 18th century the Qianlong Emperor had a version of this scroll made by taking a Song dynasty rubbing and adding parts that were missing. That version, which as of 2015 was available as a download from www.wdl.org, seems to be in better condition than the present one, which is said to be based on a Ming edition, as stated above. This one, presumably, was the one in need of repair. 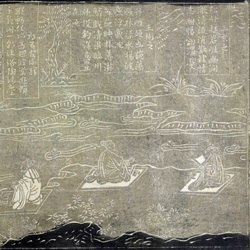 The version of the preface shown above was on a short scroll I purchased separately in 2000 from the same curio shop at Lanting; this short scoll's dimensions are 44" x 14" (1.12 x .36m). Unlike the scroll in the footnote above (see expansion), my long scroll illustrating the event does not include Wang Xizhi's preface. It is interesting to compare my scroll with the version at right, which is much more polished but presumably rubbed from the same source (the most noticeable differences are the color and some of the seals, but the otherwise near-identical appearance does not prove they were actually rubbed from the same source). Both the preface to the long illustration scroll (closeup below) and the commentary with the image at right mention Dingwu, Henan), but the Dingwu stone(s) disappeared at the end of the Song dynasty and I do not completely understand the references to Dingwu in the two scrolls. From the preface below it seems that the actual calligraphy is based on an amalgam of the Dingwu scroll and copies by 褚遂良 Chu Suiliang (596–658; Wiki), but I am still not certain whether this is the basis of my long scroll rubbing. ....The story is told of how Emperor Taizong of the Tang dynasty sent his minister Xiao Yi to obtain the original munuscript by deception. Having obtained the original, Taizong never parted with it again and had it buried with him in the imperial tomb. The Orchid Pavilion Preface now only exists in the form of copies. This stone-carved version is said to be based on a copy made by the Tang calligrapher Ouyang Xun. The original stone carving was discovered in the Qingli period (1041~1048) of the Northern Song dynasty at Dingwu (modern Zhengding, Hebei), hence the name. 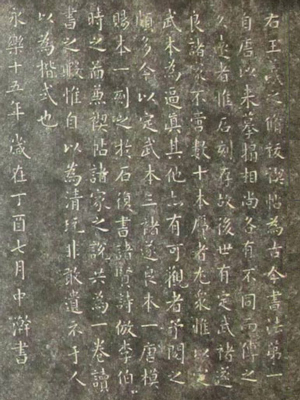 Further details of this preface are easily found online, some together with a translations, such as on Wikipedia sites here (associated commentary along with a Tang dynasty copy of Wang Xizhi's calligraphy) and here (a closeup of the calligraphy). 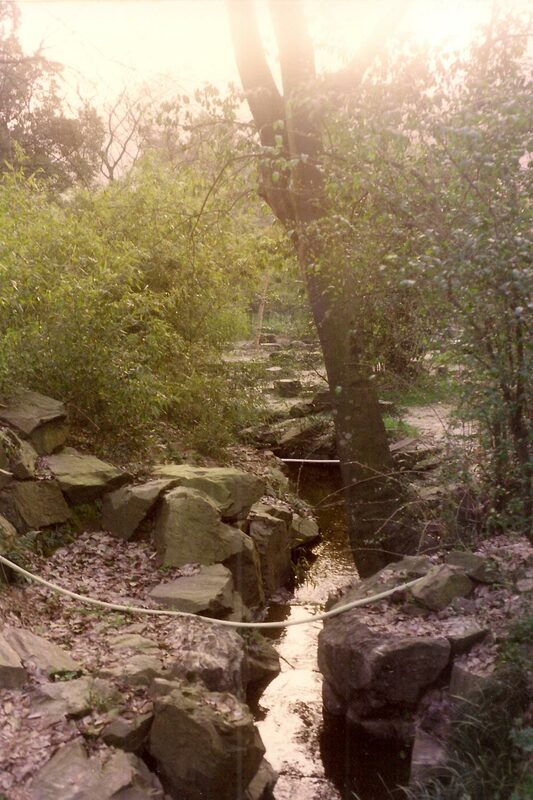 The picture at right was taken during a visit to Shaoxing's Lanting in 2001; this one was taken just upstream. The stream is in a parkland southwest of Shaoxing city; it can be found on Google maps by searching for 29.946866,120.608425; nearby Kuaiji Mountain is directly south of Shaoxing at 29.956831,120.608333. The actual site of the original Lanting is not known and there are or have been several other places claiming to be the site of the Wang Xizhi's Lanting event. From looking at the Google maps it appears that the present Lanting is west of Kuaiji Mountain, not on or by its southern slope. 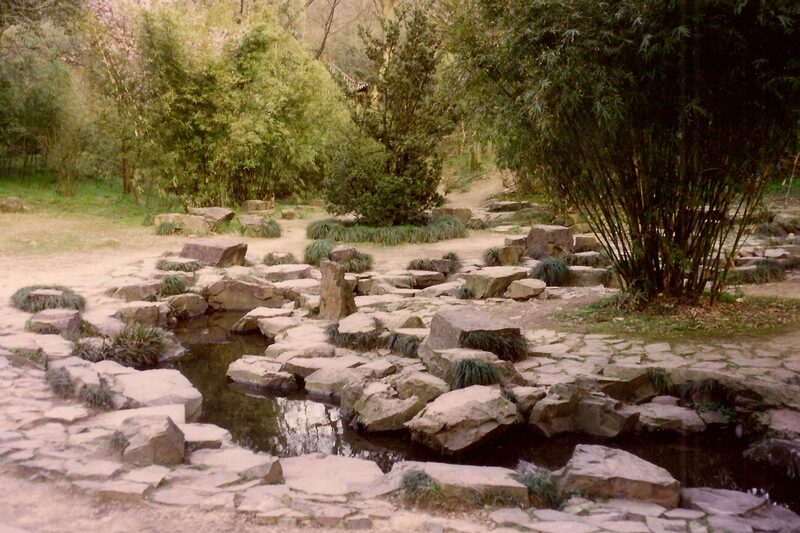 The events here have also inspired Lanting parks elsewhere, including in Japan and Taiwan. There are countless online images for the Shaoxibng Orchid Pavilion area, including those on the Wikipedia page. The name Lan Ting (Orchid Pavilion, perhaps actually referring to the the nearby stream) is said to be due to King Gou Jian of Yue (Wiki) having raised orchids here in the 5th c. BCE. There seem to be/have been a variety of names for this. The preface below says "脩祓禊 xiu fu xi"; see also 祓禊 fuxi. Elsewhere it is named according to what seems to be a traditional calendar date, 上巳 shangsi (details), or more specifically called 三月三 sanyuesan (third of the third month). However, the present Xiuxi apparently took place during muchun: the third 10 day period of the third lunar month. For more on this purification ceremony also see the commentary on xiuxi with the melody Xiuxi Yin. The present scroll is missing one poet and two poems from sheet 5 plus part of one poet and his poem from sheet 6. With the inclusion of these (as in the Qianlong edition) the scroll would have 37 poems in all. This accords with the math given on sheet 1 ([11x2] + 15), but elsewhere Wang Xizhi himself is credited with having contributed six poems, not two. This brings the total up to 41 poems. Written in the 中浣 middle 10 day period of the 7th month of the Yongle 15th year, a dingyou cyclic year (1417 CE)". Concerning 右 you, the first character of this preface, Wang Xizhi was sometimes referred to as General of the Right Army (右軍 Yòujūn), but at that time "右 you" was also used by itself as a general sort of qualifier of rank. Although on this scroll it says 飲酒三觥 drink three gong of wine, elsewhere it apparently says "three 斗 dou" (see Swartz, where this is said to be "approximately 6.5 quarts"). Wang Xizhi's own preface says "引以為流觴曲水，列坐其次" translated as "The guests are seated side by side to play the drinking game where a wine cup is floated down the stream and the first person sitting in front of the cup when it stops must drink." This seems to be an interpolation as the original says nothing about "game" or "first person sitting in front of the cup when it stops must drink". In sum, none of the original documents makes it clear when the drinking penalty must be applied. On the other hand, the competitive nature of this event leads Swartz (p.288) to compare the event to qing tan events popular at that time. Translation in Swartz, p. 298. This latter version is closer to the one partially translated in Swartz (download). To match these word counts to existing qin melodies see (and perhaps adapt to) the melodies listed under Poetry with lines of regular length. Four additional poems, all credited to Wang Xizhi, are included in other editions. Three of these are (4+4) x 5, one is (4+4) x 6. Go the top, to Liu Shang or Xiuxi Yin, or to Scenes Illustrating Guqin Melodies.